This manual is designed to guide you through the dissection of the brain of a sheep. After following the guide, you will better appreciate the three-dimensional nature of the mammalian central nervous system (CNS). We use a sheep's brain for several reasons: 1) the sheep's brain is sufficiently high on the phylogenetic scale to possess those characteristics which make moving either up or down the scale (for comparisons sake) a relatively simple matter; 2) the sheep's brain is large enough to allow most of the features in which we are interested to be seen with the unaided eye; and 3) sheep brains are readily available at a minimal cost as a by-product of the meat industry. Hints for navigating through the guide. Words that are blue and underlined are links to images or tables. Blue words that are not underlined are terms that may appear on the practicum. Information that appears in GREEN is either a hint, or a caution. RED is used to catch your eye. The dissection of the sheep's brain will assume the following sequence. You'll begin with a careful examination of many of the external features of the brain. The next step of the dissection will require that you bisect the brain along the longitudinal midline to produce a mid-sagittal section. A midsagittal section allows many of the prominent features of the internal and medial face of the hemispheres to be observed. The dissection will culminate with the creation of several coronal sections. A coronal cut is a plane of dissection perpendicular to the mid-sagittal cut that apportions the brain into front and back pieces. 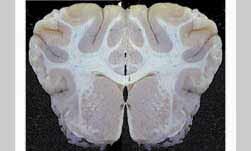 This cut allows you to view some of the deep structures of the brain . In order to discuss the brain, it is necessary to use terms that are as unambiguous as possible. Look at the following figures that contain the descriptive terminology for direction in both quadrupeds (four-footed animals) and bipeds. Distinguishing between these two classes of organisms is necessary because in the biped the neuraxis (the axis of the CNS) makes nearly a ninety-degree turn at the point at which the brain-stem merges with the spinal cord. Spend some time studying these figures until the terms become automatic for you. In addition to these terms concerning direction, we must also use nomenclature describing the planes of dissection. Use the following figure below to help you to learn these terms. A sagittal section follows a plane of dissection that is parallel to the longitudinal fissure, which separates the cerebrum into two hemispheres. 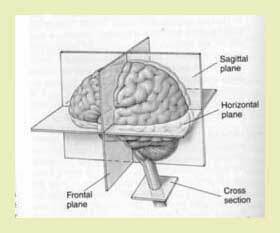 A midsagittal section would bisect the brain into two mirror-image right and left halves. A frontal section, more commonly called a coronal section follows a plane of dissection that is perpendicular to the sagittal plane. The coronal section depicted would follow a plane of dissection through the ears to bisect the brain into "anterior" and "posterior" portions. The horizontal cut shown would produce a brain cut into dorsal and ventral portions. The final plane of dissection refers to the cuts made to the spinal cord. This plane of dissection is known as either a cross section or a transverse cut. Transverse cuts section the spinal cord as one would slice a salami. There are two principal cells in the brain: neurons and glia. Neurons account for the two types of tissue that can be distinguished: white matter and grey matter. The appearance of white matter is due to the myelin sheath found on the axons of some neurons. In contrast, cell bodies have no myelin sheath and as a result they look grey in color. bundle of axons inside the CNS and is called a tract. The nomenclature of nerves allows you to know where a nerve, or tract begins, and to which structure or region it projects. The first term in the nerve or tract's name is the starting point and the second term the end point. Thus, the cortico-spinal tract is a bundle of axons that projects from the cortex to the spinal cord. The spino-thalamic tract would be a bundle of fibers carrying information from the spinal cord to the thalamus. Grey matter refers to cell bodies. A cluster of cell bodies inside the CNS is called a nucleus, while a cluster of cell bodies located outside the CNS is called a ganglion. If you have mastered the information in this section and have made study cards for each important term, proceed to Lab 1.